Frywall, the kitchen tool that frees chefs to cook mess-free, launches Kickstarter campaign. Frywall | Stops spills and splatter, whether frying, sautéing, or making sauce. "Cooks can finally dispense with wiping down the range, counters, and nearby pots after every meal." Gowanus Kitchen Lab is announcing the launch of a Kickstarter campaign for Frywall, a simple-but-radical kitchen tool that liberates chefs to cook mess-free by eliminating spills and splatter. Cooking splatter is a “dirty open secret”—never mentioned by celebrity chefs, never photographed in cookbooks or blogs, yet a constant aggravation for every experienced cook. Cleaning a grimy and bespattered stovetop can depress even the will to cook. But liberation is at hand. 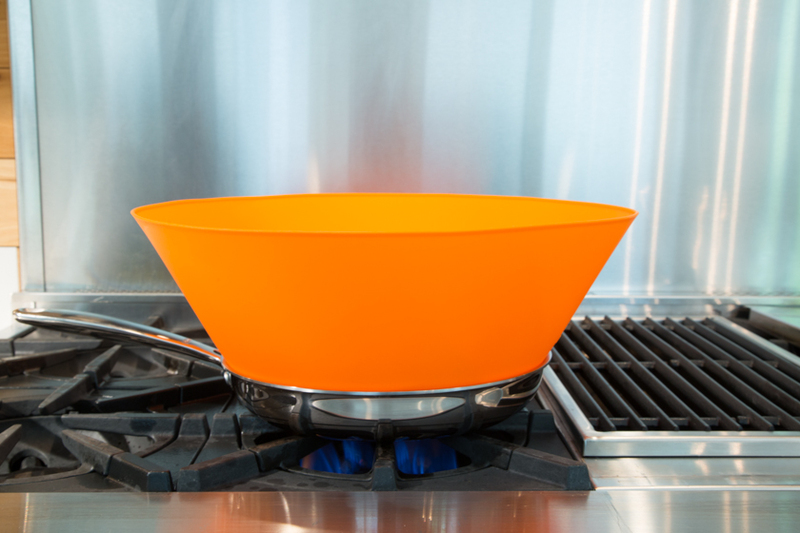 Frywall is a silicone shield that extends up from the rim of a frying pan or pot, and blocks splatter and spills from reaching the stovetop. Unlike splatter screens, it provides uninterrupted protection, even when adding, removing, or flipping ingredients. Just as importantly, it lets steam escape freely, minimizing condensation and promoting perfect searing and frying. And Frywall isn’t just for frying. 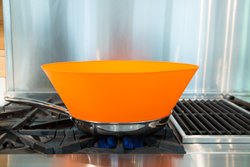 It catches splatter from bubbling sauces, and stops over-filled pans from spilling onto the stovetop. No matter the menu, Frywall keeps the sizzle in the pan and the mess off the stovetop. So cooks can finally dispense with the tiresome exercise of wiping down the range, counters, and nearby pots after every meal. Following use, Frywall cleans up easily by hand or in a dishwasher. It never gets gunked up with oil, like splatter screens do. For easy storage, Frywall rolls into a compact sleeve the size of a large cup. Frywall is made of 100% FDA-compliant high-temperature silicone and contains no BPAs, plastics, or toxins. It is able to withstand sustained temperatures of up to 450°F, making it suitable for just about any cooking technique. Frywall comes in two sizes, Frywall 10 for 10” pans, and Frywall 12 for 12” pans. For more information about Frywall, or if you’d like to schedule a conversation with Yair, please email yair(at)frywall(dot)com. Yair Reiner holds an MBA from New York University and a Masters in Comparative Literature from UCLA. Before inventing Frywall, Yair spent over a decade as a Wall Street stock analyst covering the technology and aerospace sectors. Prior to working in finance, he was a translator and public radio producer.